The demands made of a continuo organ often outstrip the possibilities of a physically small instrument. On the one hand, a small mobile instrument is required but it is often asked to satisfy demands from gentle continuo or recitative work up to the accompaniment of sizeable choirs. We have addressed these problems in 1997 with the new Five Stop Continuo Organ and have re-thought the whole role of the continuo organ from basic principles. Firstly, the organ was designed to be as light as possible without sacrificing sturdiness. Wherever possible, light materials were used (mainly pine for the case and soundboard), and materials were kept as thin as possible to save weight. The result is an instrument which is no heavier than some other much smaller organs. More importantly, we thought about the tonal requirements made of these instruments. 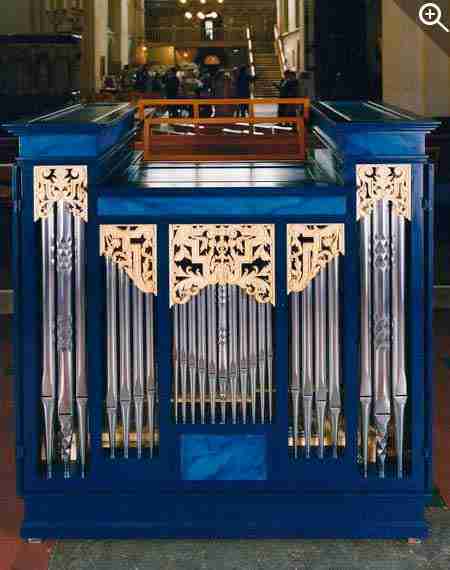 Most importantly, we wished to give the organ more body when used to accompany choirs. This we achieved by including a Principal 4ft, although the lowest six notes did have to be made common to the Chimney Flute. Flutes at 8ft and 4ft pitch are often called for, so the organ has two stops at 4ft pitch. As in most such instruments, a Fifteenth 2ft is included but here the stop has been voiced to ensure it can be played with the stopped Diapason alone. As a crown to the chorus, the fifth stop is a 22nd bass/19th treble, which gives the solo capability in the treble and clarity in the bass, working almost like a one rank mixture. Finally, the stops are once again divided, so different registrations can be selected in the bass and treble with a unique design of stop knob, as in all these instruments, allowing two halves to be drawn together with the greatest of ease. It was first used in the Royal Albert Hall in a performance of the B Minor Mass by The English Concert, directed by Trevor Pinnock. It was promptly christened "The Aquarium". This instrument is basically meant for hire purposes and is already proving popular for concerts and recordings. 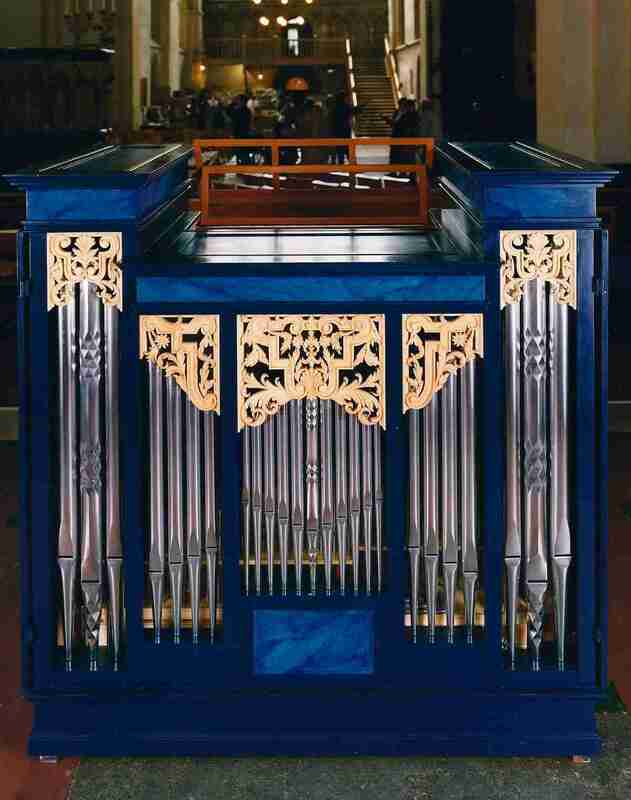 A similar instrument with a Regal in place of the 22nd/19th has been ordered for a concert hall in Oman.